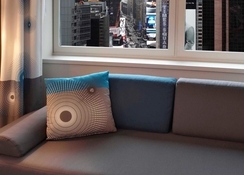 Located in the heart of New York, in the Times Square district and close to important museums in Manhattan is the Novotel New York Times Square hotel. 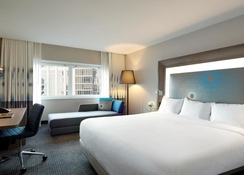 It is a four-star hotel that features 480 spacious guestrooms, where you can find modern decoration and a contemporary design, with furniture of minimalistic design. In them you can find these facilities: a living area with a sofa bed, a complete bathroom with bathtub, complimentary toiletries and hairdryer, individually controlled air conditioning and heating, flat screen TV, and internet connection, among others. In the modern lobby there is a reception desk and a 24-hour reception service, tourist information, luggage storage, and all the services guaranteed by the Novotel chain and the hotel category. 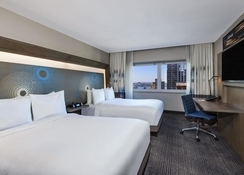 In the Times Square district, on the well-known Seventh Avenue located in the urban centre of New York and close to several museums is the Novotel New York Times Square. In the vicinity of the hotel you can find several public transport stops (metro and bus), which communicate excellently with any point of interest and in its surroundings. You can visit Central Park – 700m, the Battery Park – 6.8km, the Brooklyn Bridge – 6.6km, the Cathedral of Saint John the Divine – 5.2km. The JFK airport is about 26km from the hotel. 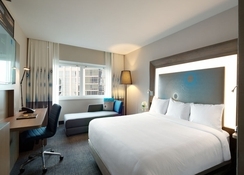 The 480 rooms feature modern décor of contemporary design, with ergonomic furniture and carpeted floors. The spacious rooms offer a living area with a sofa bed, a complete bathroom with bathtub, complimentary toiletries and a hairdryer. Crib service is available and there are rooms adapted for people with reduced mobility. 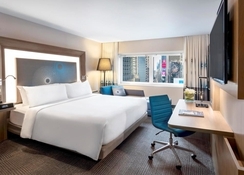 Novotel New York Times Square features an elegant and bright restaurant that offers stunning panoramic views of Broadway. It offers modern and popular American cuisine, with vegetarian specialties and buffet breakfast, lunch and dinner service. There is also an urban bar where you can enjoy a variety of alcoholic and non-alcoholic beverages and delicious cocktails. The facilities at the hotel are adapted for people with reduced mobility. The rooftop terrace lets you admire the city. 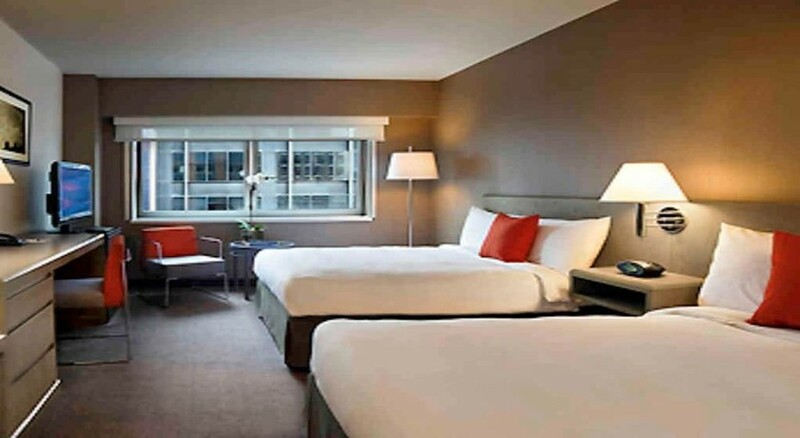 The hotel also features a gym where you can exercise, a gift shop and press, a recreational games room, an area with computers with internet access and two modern and multifunctional meeting rooms with a maximum capacity for 12 people.